It’s remarkable that Baroness is still a band, really. While on tour in England in 2012, only a month after the group released its mammoth double album Yellow & Green, the Savannah foursome suffered what seemed a fateful accident when its bus plowed through a guardrail and plummeted 30 feet. Fortunately all survived, but founding member, frontman, and cover-art artist John Baizley broke his left arm and leg and bassist Matt Maggioni and drummer Allen Blickle fractured vertebrae. The physical and mental recoveries were admittedly long and tenuous and included amicable splits with the aforementioned rhythm section. But the band dusted off and soldiered on—at least a fraction to spite the disaster—and now return with the new album Purple that’s being spun as a form of suture, the finale of the healing process. The story is the kind of stuff from which “Based on a true story” movies are made. Right away the album title suggests the healing of a bruise—and the band’s heavy-handed introspection and ambition only grows from there (hell, the group even formed its own label, Abraxan Hymns, to release the record). 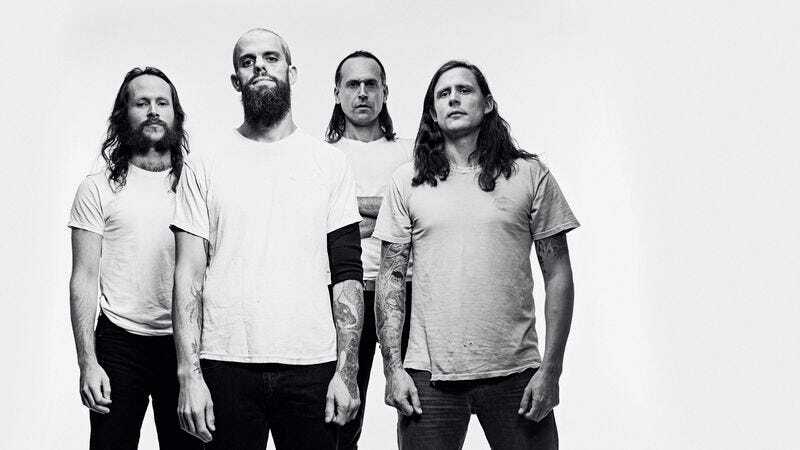 Baroness has long been considered a metal band, though even dating back to its seminal full-length, 2009’s Blue Record, the group’s prog leanings and Baizley’s exultant vocal melodies tended to round off the hard-nosed edge of the band’s sound (on Yellow & Green, even more so). Purple is as far away from metal the band have ever been. While the opener “Morningstar” begins with a patented Baroness riff—one of those that would work well accompanying a duel by battleaxe—it swiftly transforms to a pensive and anthemic brand of sludgy gruff rock, not far from the pro-beard kind propagated in the early aughts by a label like No Idea. 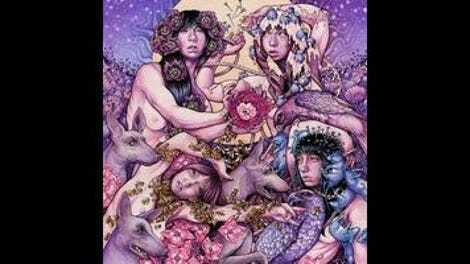 What defines Purple, however, and allows it to transcend a mostly hokey, overwrought sound is the technicality and experimentation with which Baroness attacks melody, mostly via the busy drumming of Sebastian Thomson (also of Trans Am) and expert guitar work by Baizley and Peter Adams. While off-kilter harmonies and frenetic, peculiar noise subtly undergird solid tracks like “Try To Disappear”—which also features a hammering, blown-out interlude that you can’t help but want more of—symphonic flourishes and brushes of electro become slightly cumbersome on others, and the occasional case of overproduction seems to distort their directive to find closure (Dave Fridmann, who’s worked plenty with the weirdos in the Flaming Lips, produced). Still, through it all the rejuvenated Baroness is totally inspired, not only to be making new music but also to have the ability to make new music. And you can hear it. The seven-minute opus “Chlorine & Wine,” which includes slow-galloping Maiden-like riffs and revelatory lyrics like “And my doctor’s unable to cut through the cable that leads to my mind,” is occasionally led astray by too much meandering post-rock. But when the all-in group chorus rips through near the end and the hyperfied guitar cuts in, it’s damn hard not to pound your fist into the air, on your chest, through a wall, whatever.